Integration with Basecamp is based on To-Do lists. Each time new issue is reported to Bugsee, we create new To-Do item in Basecamp. Make sure you have at least one To-Do list in your Basecamp account to map Bugsee application to it. You can use any existing list or create a new one. Select "OAuth" authentication type and click "Next". 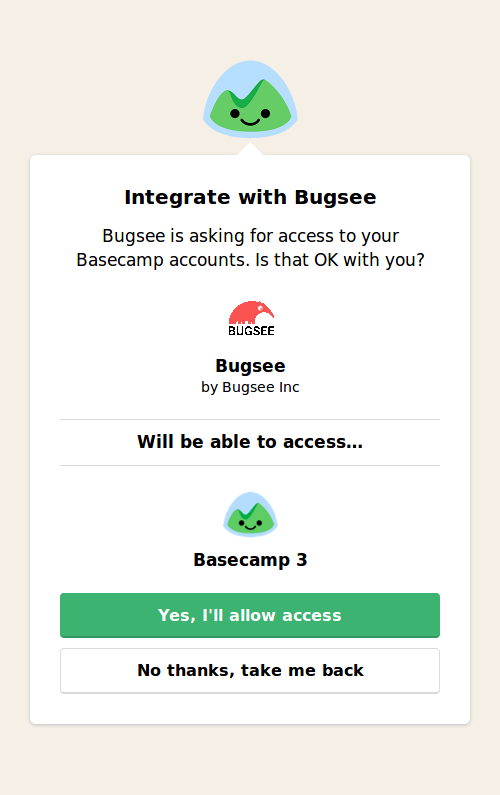 You will be presented with the following window asking you to allow Bugsee access to your Basecamp. Click "Yes, I'll allow access" to give Bugsee requested permissions. We describe here only specific configuration steps for Basecamp. Generic steps are described in configuration section. Refer to it for more details. We use a notion of workspace here as an alias for a project in Basecamp. While applications in Bugsee are mapped to To-Do lists in Basecamp. So, you need to select workspace to load To-Do list from it on a mapping step.